Tickets bought will be refunded. Between the Dog and the Wolf is a site-responsive performance where the audience crosses an unnerving threshold between hope and fear. In the twilight hours, when the shadow of a dog becomes the silhouette of a wolf, it is hard to distinguish friend from foe. Darkness is falling across Europe. In the embers of the dusk, shadows form and silhouettes distort. Fear begins to take hold in the confines of the familiar and comfortable, the unknown and dangerous, the domestic and the wild. Who is the dog? Where is the wolf? And what happens in between? Arbonauts was founded in 2012 by Helen Galliano and Dimitri Launder. They devise and direct bold, site-specific performance that starts where theatre, installation and dance collide. Between the Dog and the Wolf is their third London production, following sell-out runs of Biped’s Monitor in Nunhead Cemetery and The Desire Machine in the Brunel Museum’s subterranean tunnel shaft - see the video below. 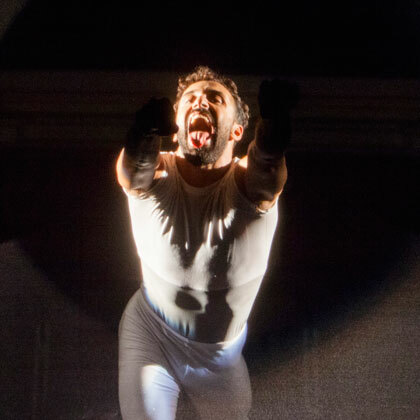 Co-commissioned by London International Mime Festival and Shoreditch Town Hall, Between the Dog and the Wolf has been specially created for Shoreditch Town Hall's iconic Council Chamber, the meeting point of light and power. "Perfect for thrill seekers, horror fanatics and those who are seeking unconventional theatrical experiences"
"Surreal, intriguing and magnetic work"
"A terrific spectacle…the soundscape is wonderfully loud and physical"